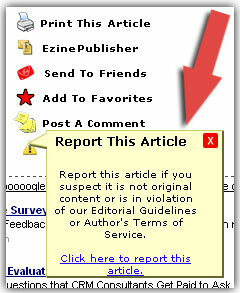 Giving power to the people, we’re now enlisting the million+ folks who visit EzineArticles.com the ability to tell us if an article is not original content or worse. You can find this new feature in the article tools to the upper right of any article. It’s the last menu item. Just hover over it with your mouse and it’ll give you an option to report the article as suspect for us to further investigate. The majority of expert authors send in only original content that they have the exclusive rights to, but for the very small fraction that may not follow the posted editorial guidelines or author terms of service… we’re going to enlist the help of our users to identify low value or suspect content. We know this may raise our workload, but it will also help us keep the database clean of content that shouldn’t be in the database. In the end, we’re doing this to raise quality. It also will assist the legitimate authors to know they are in better company as the lowest quality articles get nixed… who knows, it might even help raise the bar so that authors know they may lose their account if they attempt to abuse the rules by sending in PLR or non-authorized content. I think this feature may be abused by people with similar article topics looking to “hurt” the competition. When are you going to make a list of websites that abuse and steal our articles? And, what about sites that divide our articles into three parts with the bio buried on the third page without live links? This sounds like areally good idea to me. As an author who spends time and effort on writing his articles I object to having my efforts negated by unscrupulous people who are only trying to make a fast profit off others efforts. I would suggest that maybe letting the author have a copy of your investigation into the abuse, together with information about how to proceed with some kind of compensation claim in the country concerned, might reduce the instances of deliberate intellectual theft. 2. Untrustworthy people who “turn in” articles that were actually legitimate. As for me, I doubt I’ll ever use it, simply because I don’t know how to tell a legitimate submission from an illegitimate one. I appreciate this type of tracking and enforcement tool. With the massive amount of material on the information super hwy., a self-regulatory tool like this can be a powerful tool. I would much rather have us regulate out industry than the government. Sure, there will likely be some, as Derrick suggested in his comments, that may abuse this service, but what system for good isn’t abused by some? I say thank you for adding this feature. I agree an honest author has nothing to worry about, especially since the burden of proof is on the accuser, and they can’t prove their false accusations. Nothing is perfect, and it will take some time to test this feature, but it is definitely a worthwhile idea. Chet, you put your articles up on here to give them exposure. You can expect other people to publish them to make PPC income, but that’s the point of this service being here! As long as your attribution is on the site, that’s what you’re looking for, as it will enable you to rank higher in the search engines. That’s the main reason for publishing articles; also of course, you may get some traffic from the page that publishes your article. Bob, I hope you’re right! My account was once disabled because the editorial staff thought that I was guilty of submitting a PLR article. They did this because somebody had published the article without any of my attribution. I had to explain that I did write the article, and that the site had taken the article in violation of the ezinearticle terms, before they reinstated my account. What upset me was that this all happened without EzineArticles contacting me in the first instance to get my side of it. I accept that mistakes can happen, and I hope that the team learned from that mistake. Yes, it is possible that this tool could be used for evil, ;-) or I should say not as it was intended. Any incidents reported to us will not result in an automatic removal/deletion of an article. Each incident will be handled on a case by case basis and reviewed and investigated accordingly. David, With over 20K authors and another 200+ signing up daily, as much as we would like to proactively contact each author we suspend, it’s just not operationally realistic to do so at this time. The primary reason is that well over 50% of the authors we suspend never even bother to contact us about it as chances are they were/are scammers to begin with. We would much rather spend that time working with an author that was suspended for whatever reason and cares enough to email us about it and get their account reinstated then spend that time emailing people that may not even care. To: John R Haughton, We won’t be releasing any investigation to any author just like we won’t be releasing any private author information to any article abuse reporter. To: David Thomas: We’re considering a fee-based level of membership that would allow us the revenue to be able to contact the author if we suspend their account for any reason, along with other premium levels of author support. No ETA yet, but a survey will be sent to a select group of authors this month yet. I know unscropulous scum will attempt to attack various authors who they disagree with. But who cares if they cannot prove infringement. Meaning it will just waste EzineArticles.com’s time. And it may weed out a few jerks to steal work. I have noticed a few people steel my articles now. Silly scum. Good idea Chris. It’d be nice to weed out some of the articles of dubious quality, although people could always rate the article as “Could use improvement.” I don’t think very many people take the time to rate articles–likely because it’s way on the bottom of the page, but personally I’ll take time to check out articles that others have said they liked, so I really value the rating system. Thanks Chris as always for working to make EzineArticles.com the best article submission site around! Yes I agree out of the last 15 articles that I have written and posted I have found by doing a search for my name and article title that at least half the articles have had the links and or author bio removed. One web site has left the bio without links but under that he has even claimed the article for his own. Can we really trust EzineArticles.com to do the right thing. I think that if someone disagrees with an article and “checks it” or flags it then the EzineArticles folks will wish to remove it so as to not offend anyone. Because EzineArticles is quite a Politically Correct website, with all its many countries of authors? God help if someone writes an article which is total truth and it happens to offend someone living in denial of reality. I do not believe this is a good idea. I am tired of censorship and political correctness. If some is stealing content, hey that is one thing, but about the time, people flag articles or give them one-stars because they are a religious fundamentalist of the VooDoo Witch doctor or so politically set in their ways they attack anything that is not their Liberal views is a real problem. You are feeding this problem if you do not allow the truth or observational backed-up truth to be told. That is a bad path to go down in the “Freedom of the Press”. No wonder your website does not allow Cartoons? Censorship=Bad and if EzineArticles goes that way then well you are backwards from dab.